Following the formal rules of dodecaphony, for Zwölftonform twelve consecutive titles are composed exclusively with twelve consecutive frequencies. The basic structure for each title is made by up to twelve different sound samples from a generated sine waveform. Built on this basis, these arrangements reference and illustrate especially over time the complexity and increasing compression of the original shape. Following the serial character of the composition concept, the titles were published consecutively as EPs. 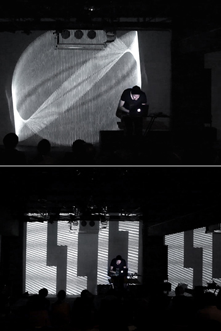 For the visual translation and presentation as a live performance and audiovisual installation, the sinusoidal waveform is abstracted along the album convention. Following parameterized principles, twelve visual embodiments of this basic shape arise. The increasing complexity is now visible and the prevailing simplicity at the beginning inverted by the end. This evolving aesthetic is punctuated with a grid that divides the base with the value of the sample number.